Isn’t it funny how momentous events tend to cluster around certain dates? June 18th is one of those days. On that date in 1812 the United States declared war on Great Britain, setting the stage for three years of American triumphs and defeats, and giving Constitution and her crew the opportunity to make themselves famous. On this same day in 1815, empires collided in Belgian farm fields. Since Napoleon Bonaparte’s abdication and exile to Elba in April 1814, he’d been plotting his return. He slipped back into France in early March 1815, and quickly rallied his old comrades to his side. With an army of more than 70,000, Napoleon marched into southern Belgium (then part of the Kingdom of the Netherlands) in a bid to strike a decisive blow against gathering coalition forces bent on his destruction. Facing the French was a combined army of soldiers from Britain, the Netherlands, and the German states of Hanover, Brunswick, and Nassau. A large contingent of Prussians would soon arrive on the field. After several brutal engagements culminating at a village called Waterloo, the allies sent the French army into full retreat. The two sides left some 70,000 casualties on the field. Out of the destruction rose a new commitment to peace and set the stage for a modern Europe. 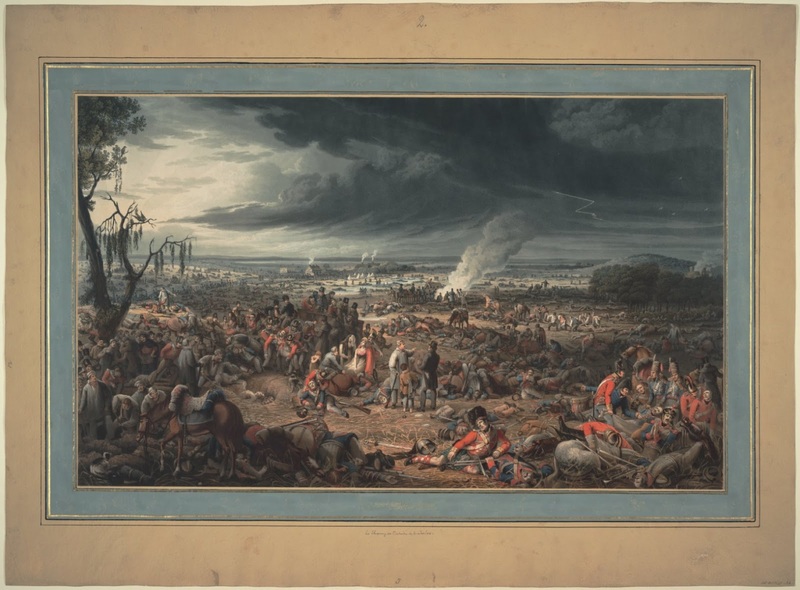 “The Field of Waterloo, as it appeared the morning after the memorable battle of the 15th of June 1815,” by John Heaviside Clark and Edward Orme, Anne S.K. Brown Military Collection, Brown University. In America, reaction to the battle was mixed. Some despised the British victory and feared their next move. Some thought Bonaparte should come to America (and indeed, it seems Bonaparte himself considered crossing the Atlantic). In the end, the British forced the former emperor to while away his days on the bleak and remote island of St. Helena. His small house on a plain high above the sea became a place of curiosity and pilgrimage for sailors who stopped to replenish stores in the years after his death. How many of them thought about the man and his ambitions, and how the wars he spawned drew the United States into its own war with Britain in 1812?